The PB Series maximizes efficiency with a design that minimizes space and set up time while eliminating the need for complicated and costly base plates for mounting. This revolutionary design available only from Sjogren represents a breakthrough in straightening for small diameter wire. The spindle cartridges enable significantly faster line speed over conventional straightener rollers — as much as +30% — as well as reduced changeover downtime. Measured in millimeter increments and available in a wide range of roller configurations, this modular system can be mounted in eight different orientations. Capable of high load carrying applications and compatible with all types of wire (ferrous and non-ferrous), they are used across a spectrum of industries from heavy industry wire rope to fine mesh wire. Available in a wide range of wire sizes and roller configurations, the Inch Series assembly is mounted on a baseplate take advantage of industry-proven straightening configurations to deliver optimum performance over its lifetime. Accommodates high operating temperatures and a wide range of applications. Applications with multiple wires in close proximity benefit from the slim profile and versatility of the Narrowline. Left- and right-hand models are available to make them easy to incorporate into your process. Ideal for strand galvanizing or annealing, weaving, or mesh applications. 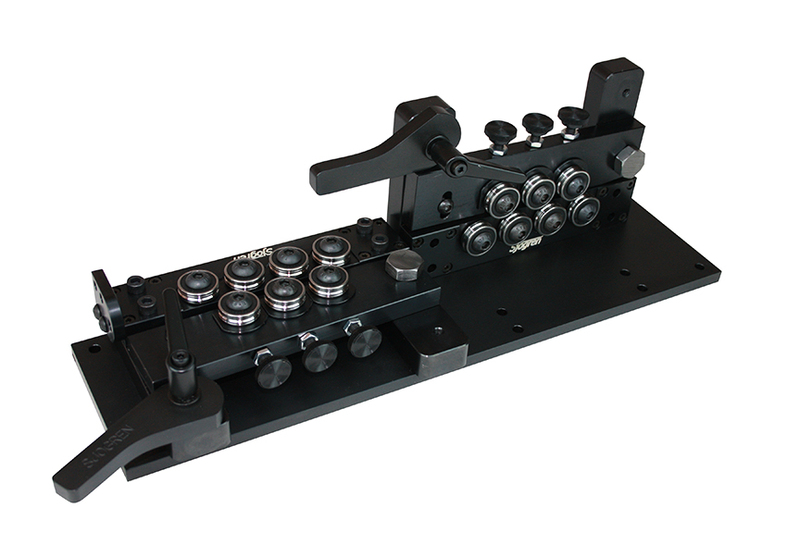 Setting times are greatly reduced by having just two adjusting screws for the entire Tilt Rail assembly, with quick-release T-handles allowing easier stringing and changeover. Ideal for short-length wire products such as nails or other fasteners. An economical solution for applications where there is not a frequent need to open the assembly to re-feed the wire or adjust for different wire sizes. Available with custom groove profile rolls to fit your specific application. Independently adjustable rolls on a single plane assembly. For larger diameter wires — up to 30mm / 1.18″ — our Heavy Duty single plane straighteners allow for easy wire stringing and changeover. Built for the rigorous demands of large diameter output, these modular straighteners are ideal for screw, bolt, and nut making. By enabling the operator to individually adjust each roll, the Completely Adjustable straightener can maintain exact consistency with your current straightening assembly. Ideal for end mounting on spring-making or wire-forming machines. When only simple straightening or back tensioning is called for, our 3-Roll assembly offers precise performance at an economical cost. Also can be used for wire casting and guiding, with the accuracy and durability of Sjogren’s precision grooved rolls. If your production tolerances are especially fine, our Micrometer Adjustment heads can fit on any style straightener and will provide clear and precise measurement of the wire centerline opening. Available for a wide range of wire diameters. Sjogren makes an ergonomic, hand-held straightener to enable off-shore and land-based oil rigs to work more easily with slicklines, wirelines, or measuring line. Keeping cable, tubing, or bars straight improves process efficiency.